The above picture displays one of the consoles that the telecommunicators utilize. 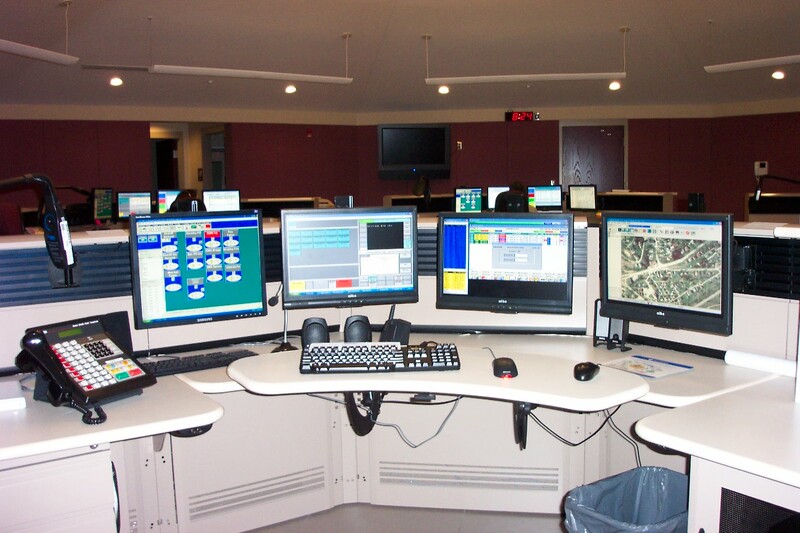 When a 911 call is received, the four-monitor computer system has information readily available to assist the dispatcher. The system provides detailed information to the telecommunicators about the caller using the Solocom Phone System. Using the callers' phone number, the Computer Aided Dispatch system displays a caller's name, address, and directions as well as the nearest fire, emergency medical services transport, and police agency to respond, by using an emergency service number. Using the Motorola's CENTRACOM 5500 System is computer based. Telecommunicators are able to dispatch in both analog and digital frequencies throughout Raleigh County. Multiple tower capabilites enhance the ability for better communications with field units. Interact's Geo is a full featured mapping system that displays streets and structures in Raleigh County. The mapping system can be customized to include hospitals, railroads, public buildings and even hazardous material storage sites as well as other vital facilities. The System houses arial photos of Raleigh County.